Have you appeared in NDA and NA exam II 2013 and looking for written exam results? UPSC has officially uploaded the results of NDA & NA exam II of 2013 today. Check out list of candidates who have passed NDA & NA exam II 2013. UPSC has held NDA & NA examination (II) 2013 on 11th August 2013 in all UPSC centers of India. Notification of NDA exam II 2013 was released on 04th May 2013. Admit cards of NDA & NA exam were issued by UPSC online from 20 July 2013. NDA & NA exam II 2013 question paper was little bit tougher than the previous exams held by UPSC. Based on the performance of written test of NDA & NA exam, UPSC has shortlisted candidates for SSB interviews and published the results. Candidates will be chosen for the following courses. Both the courses will commence on 30 July 2014 at National Defence Academy. Candidates will be admitted into Army, Navy and Air Force wings of NDA. All candidates whose names are there in the results declared by UPSC for NDA & NA exam II 2013 should send their photostat copies of Matriculation (Xth class), Intermediate (XIIth class) certificates to the following address. Additional Directorate General of Recruiting, Adjutant General’s Branch, Integrated Headquarters, Ministry of Defence (Army), West Block No. III, Wing No.I, R.K Puram, New Delhi –110066. 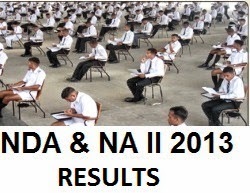 Here, we have published the results of NDA & NA exam II 2013 published by UPSC. Check out and find out whether your name is there in the results or not.